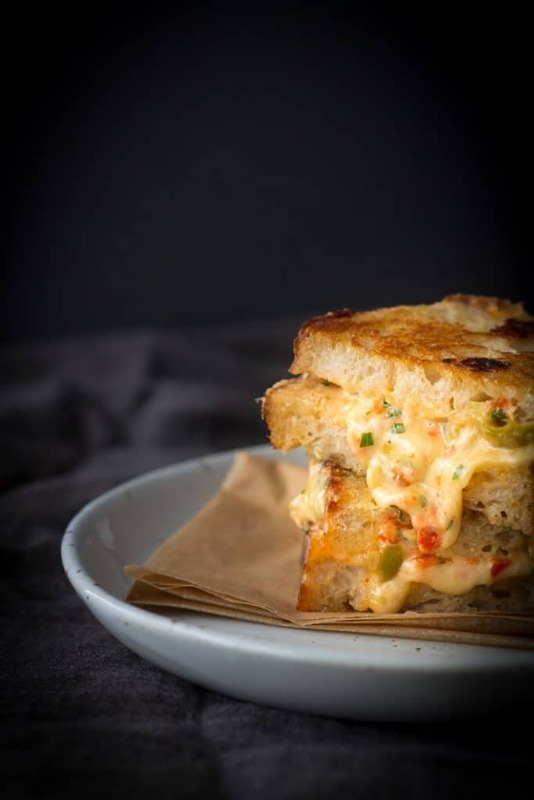 The ultimate grilled cheese sandwich that is full of gooey cheese, spicy peppers and salty olives sandwiches between two slices of crispy, golden toasted sourdough. Jump to Recipe! 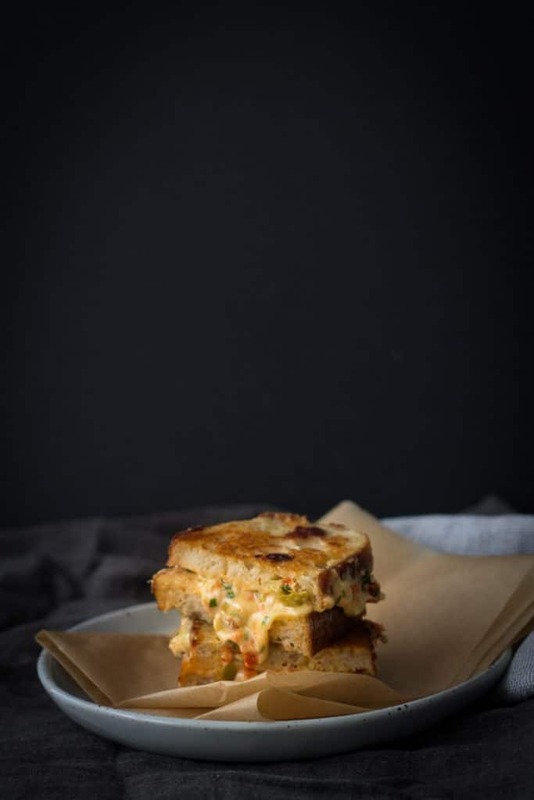 I have been seriously craving these spicy grilled cheese toasted sandwiches (or toasties as we call them down under). Anything grilled and full of melted cheese is my jam right now. Well, most of the time, one night recently I became obsessed, yes obsessed, with curly fries. Why? I have no idea what it was about this kid’s junk food that had me craving it. My darling husband didn’t even try and talk me down from the ledge, didn’t even try and reason with me that normal fries are just the same just not curly (which at the time wouldn’t have believed anything other than the fact they were completely separate entities). Instead he calmly went online and did a search for curly fries on Uber Eats (thank goodness we live the age of Uber Eats he bet he was thinking) and like an angel descending from heaven 30 min later the delivery driver arrived at the door with curly fries (and pizza and buffalo chicken bites because it’s always good to have a well rounded diet with variety). Why the cravings? I’m sure you’ve guessed by now or are speculating. Well, in September we will have another little baby boy joining our family. Yes, come September my life will turn upside down and into chaos with three little boys in tow. Despite only being in my 30s I predict that in a year’s time, with three boys, I will quite easily look like I’m of retirement age. If anyone reading this has three boys, please let me know your secrets! I am beyond excited but I think it’s normal that I’m also a little (actually a s*#t tonne) scared! Good quality bread. My favourite is the sourdough loaf from a local bakery called Wild Wheat here in Auckland. I like to stock up on a few in my freezer so I’ve always got some yummy bread on hand for grilled cheese sandwiches. It’s also awesome toasted and topped with creamy scrambled egg. Cut your bread on the thick side. We don’t want any thin sandwich slices, good thick rustic slices are the best. They get a little squashed in the sandwich press so the toastie can handle a couple of thick slices. Mayo. If you’re making my mixture then the mayo is all mixed with the cheese but if you’re just making a plain cheese toastie then you’re also going to need mayo. Generously spread it on the inside of both slices of bread, or if you want to go really luxury spread it on the inside AND outside of the bread to make one deliciously golden and crunchy grilled cheese sandwich. A little Dijon mustard is also pretty good in there. 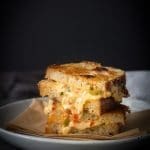 I’ve called this the Ultimate Spicy Grilled Cheese Sandwich because it is so luxurious and is good every time. I tried this flavour combo for the first time once when I was in the States. They serve the filling as a dip and call it Pimento Cheese. Now I have no idea where to find pimentos in New Zealand so I’ve substituted the pimentos with some spicy peppers and tried to recreate some of the flavours of the dip. I love olives so I’ve added a few of those for a salty tang (and they are the only things I could find with pimentos in them here in New Zealand) and I’ve toasted it all in two big slices of my favourite sourdough. The recipe is generous so if you’re feeling in a less cheesy mood then, by all means, fill your sandwiches with a little less of the filling – it is quite rich…but oh so good! 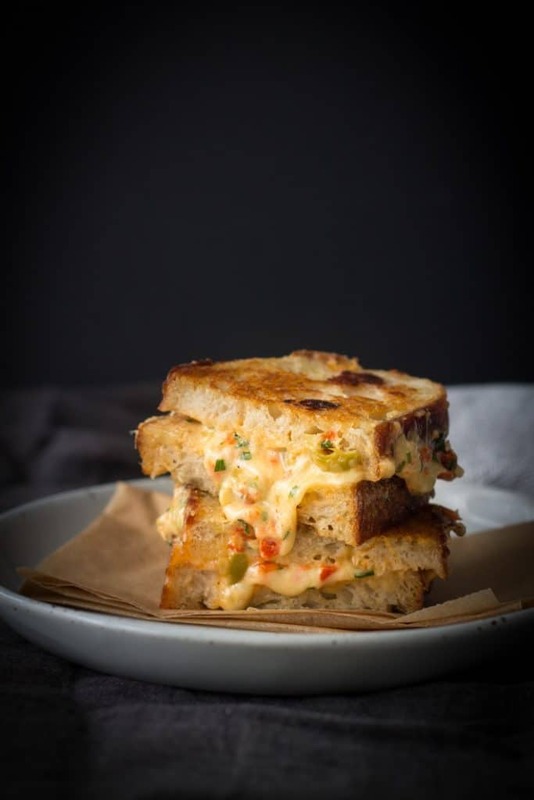 The best ever grilled cheese sandwich that is full of gooey cheese, spicy peppers and salty olives sandwiches between two slices of crispy, golden toasted sour dough. 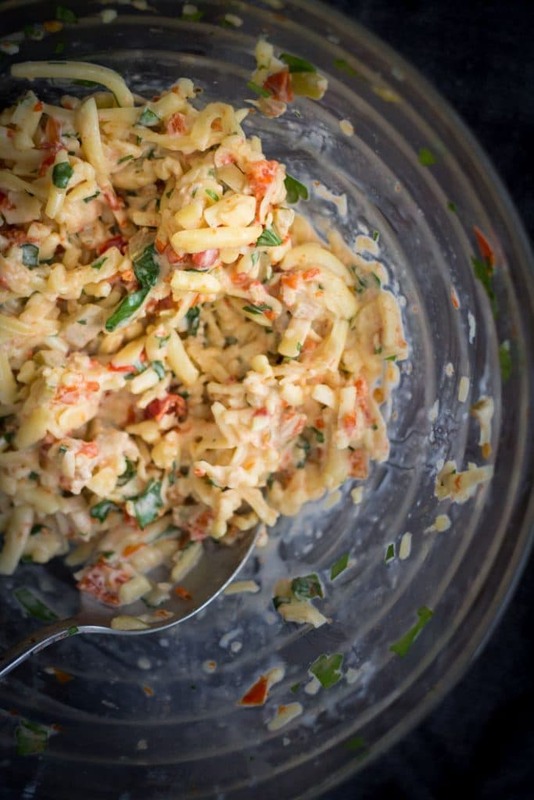 In a medium bowl mix together cheese, mayonnaise, peppers, green olives, onion and parsley. Season with sea salt and freshly cracked black pepper. Set aside. Lay bread on a chopping board. If desired, butter or spread mayonnaise on one side only then flip over. Spread cheese mixture over the non-buttered side of 4 pieces of bread. Top with remaining 4 slices of bread (butter side up). Heat a non stick fry pan or sandwich press. Cook each sandwich for approximately 3 min on each side (or 6 min total if using a sandwich press) or until the toast is golden and cheese is melting. Cheese mixture will keep for up to 1 week covered in the refrigerator. Never has a cheese toastie looked so good! Great photos! Thanks for the tip about Wild Wheat I will be sure to look out for it when I am over this summer – always good to have a few landmarks when food shopping in a new city. Finally all the very best wishes for you and No. £!